Grilled cheese. You’ve made it and/or eaten it hundreds of times. You’ve loved it. You’ve been comforted by it. You’ve probably felt slightly ill after eating one too fast. You might prefer it with pickles, tomatoes or bacon. Maybe you like it with ham and raspberry jam. It’s been a part of your life since you were a kid, and chances are, you never grew out of your affection for a lovely grilled cheese. All of that may be true, but I would like to assert that I have a grilled cheese-based recipe that will make you never want to go back to the old standby. If grilled cheese is a cold glass of Diet Coke with ice and a straw, my Spicy Chicken and Cheese Panini is a crisp glass of Pinot Grigio on a hot summer day. Both are good, but only one will make you forget your troubles. Element 1 – Hearty sourdough bread. You want it on the thick side and not at all mushy. Element 2 – Cilantro lime garlic jalapeno sauce. This is almost a spicy and acidic pesto. Element 3 – Pepper jack and medium cheddar. Two slices of each. Don’t skimp on the cheese. Element 4- Chipotle mayo sauce. Hard to go wrong. Element 5 – Chicken pounded thin and sauteed. The chicken is just another layer, not the main event. And this is how you stack it: butter, bread, green sauce, white cheese, chicken, orange cheese, orange sauce bread, butter. Toss it in the pan on medium high. Cover the pan. Cook until cheese begins to melt, but before bread burns. Flip the sucker and brown the other side. Don’t forget to use that top on the pan when you’re cooking the grilled cheese. This is the best way I’ve found to get the heat high enough to make the bread crispy, but also melt the cheese. A soggy, gooey, or a crispy unmelted grilled cheese is a crime against nature. 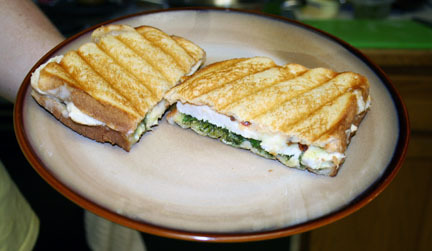 Or, if you have a panini maker, that will take care of the crispy/melty issue also. I've done it both ways. Put garlic, juice from the lime, cilantro, jalapeno and olive oil in a food processor. Mix mayo, sugar and chipotle chile in sauce. Saute chicken tenders until cooked through. Butter outside of bread. Top with cilantro sauce, layer with two slices of pepperjack, chicken, two slices of cheddar, chipotle mayo, another slice of bread and butter top of bread. Cook sandwich on medium high with pan covered. Flip before bread is burned and brown on the other side. *You get a gold star if you knew I posted this over on my other blog a million years ago. I thought it was worth a repost. This entry was posted in 5 Wine Glasses, Dinner, Poultry. Bookmark the permalink. One Response to Grilled Cheese. But Better. Oh em gee. I’d eat this every day of the week. This looks like something I’d order in a restaurant. Fancy grilled cheese? I’m sold. I’m making this. After I send Ryan to the store for a panini maker.